The 86th Academy Awards ended this year’s awards season with a bang. Ellen DeGeneres took to the stage as presenter for the second year and film stars like Matthew McConaughey, Lupita N’yongo, Jennifer Lawrence and Meryl Streep graced the Hollywood red carpet with their presence. As the stars chill with their golden statues and a few beers in the early hours of the morning in LA, we bring you the ten things you should know about last night’s awards. Ellen DeGeneres’ second year as host went without a glitch. The US TV host couldn’t resist a star-studded selfie and ran off the stage to grab a snap with some of Hollywood’s finest. Bradley Cooper did the honours and took the snap as stars Lupita N’Yongo, Brad Pitt, Angelina Jolie, Kevin Spacey and Meryl Streep among others crammed themselves into the phone screen. The selfie broke the record for the most retweeted tweet of all time, knocking Barack Obama’s ‘Four more years’ snap with wife Michelle off the perch. By 6am this morning, the photo had already been retweeted two million times. The selfie that broke Twitter. Ellen DeGeneres's pic with Jennifer Lawrence, Bradley Cooper and Meryl Streep got retweeted 1.7 million times in the first hour. 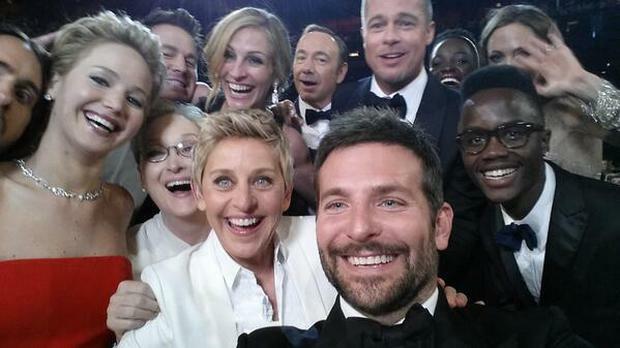 What was more heart-breaking, however, was Liza Minelli attempting to join the ‘best selfie ever’ and failing. 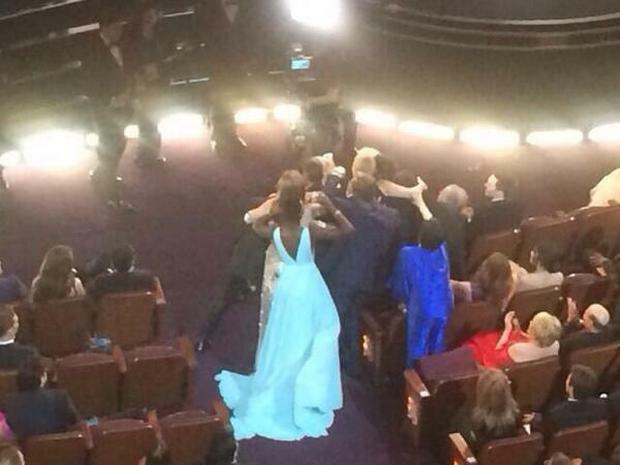 Liza Minnelli (in dark blue) trying so hard to get into the selfie gang, but failing. 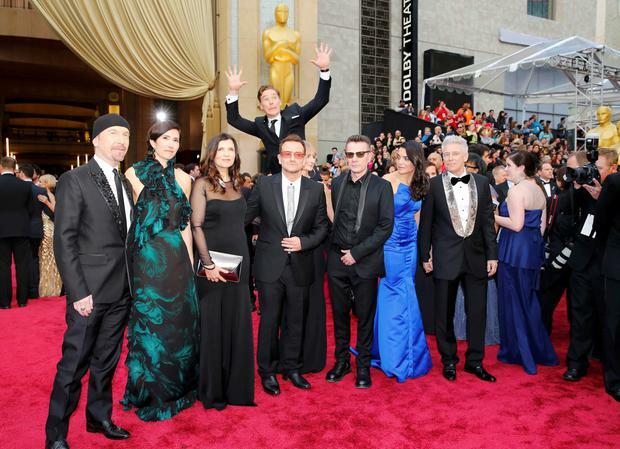 Benedict Cumberbatch earned his own social media kudos last night as he photo-bombed U2 on the red carpet. Suited and booted, U2’s Bono, Adam Clayton, The Edge and Larry Mullen Jr’s pre-performance photo was crashed by the ‘Sherlock’ star. The ‘American Hustle’ actress became a global sweetheart after she tripped accepting her Best Supporting Actress award last year. The 22-year-old fell again this year, this time tripping as she waved to fans on the red carpet. Like they say; if it ain’t broke, don’t fix it. Although the Emerald Isle were represented this year in Hollywood, the crew left award-less. Irish-German actor Michael Fassbender was beaten to Best Supporting Actor by ‘Dallas Buyers’ Club’ favourite Jared Leto. 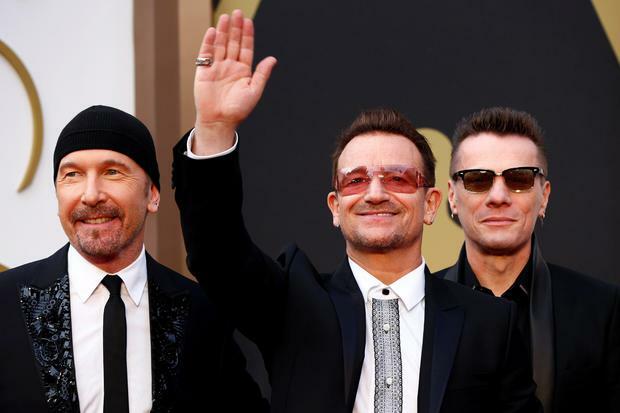 Irish rockers U2 were also pipped to the post for Best Original Song by animated flick ‘Frozen’. However, U2 did receive a standing ovation after their performance of ‘Ordinary Love’. The pressure is on for a Best Actor award acceptance speech but Matthew McConaughey managed to mix humour and emotion in what was the best speech of the night. “First off, I want to thank God because that's who I look up. He's graced my life with opportunities,” he said. “He's shown me that it's a scientific fact that gratitude reciprocates. “To my family is to what I look forward to. To my father who I know is up there right now with a big pot of gumbo, he has a big lemon meringue pie over there. “He's probably in his underwear and has a big can of Miller Lite and he's dancing right now. To you dad, you taught me how to be a man. “To my mother [Mary] who's here tonight, who taught me and my two older brothers -- demanded -- that we respect ourselves. And in turn we were able to learn how to respect others. Thank you for that mama. Nothing gets the Oscars crowd going as much as Pharell’s hit ‘Happy’, it seems. The singer jumped down from the stage to jive with Meryl Streep and Lupta N’yongo. Another thing we learnt last night at the Oscars? Brad Pitt is a major fan of pizza. 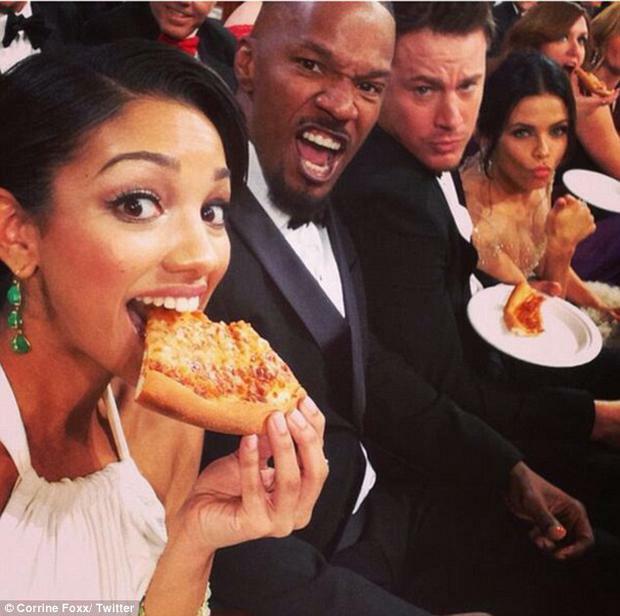 The actor chowed down on free slices of pizza as boxes were passed around halfway through the show. Kim Novak’s face became the most-tweeted aspect of the show last night. 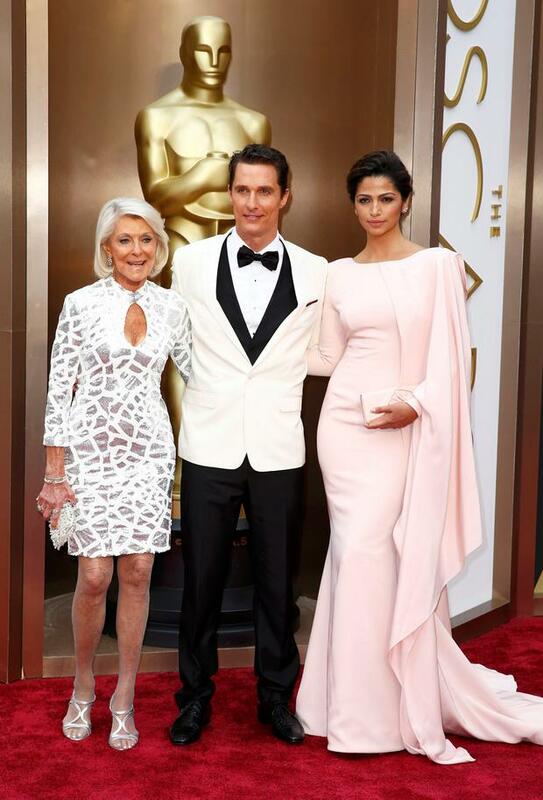 The 81-year-old took to the stage with Matthew McConaughey to present the award for Best Animated Feature. Social media exploded as commentators analysed her frozen-like face and stilted script-reading. Ellen DeGeneres took to the stage for the second time, and has already joked about preparing for her third stint as Oscars presenter. Here is her opening monologue. 10. 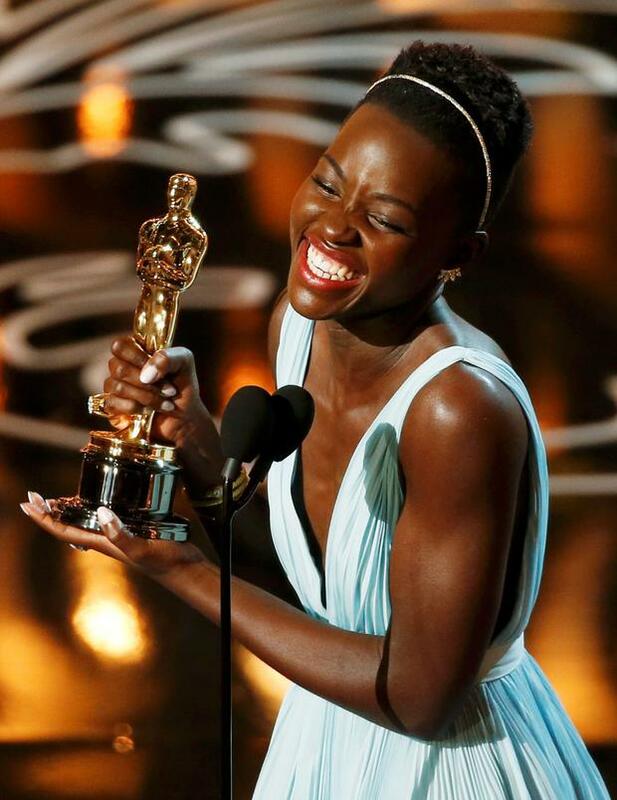 Lupita - the new J-Law? Leonardo DiCaprio has bagged six MTV Movie Awards nominations. THE Oscars are the biggie -- the one time of the year when actresses go all out to look their absolute best, whatever the cost, deprivation, hard work and agony.